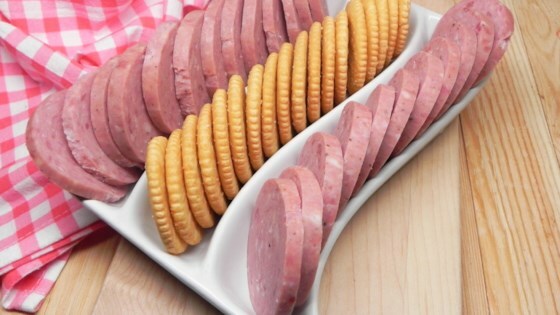 "This is a picnic sausage, similar in taste to salami. Nylon netting is available in any fabric store." In a large bowl, mix together the ground beef, pork sausage, curing salt, liquid smoke, garlic powder, peppercorns, paprika, sage, and onion flakes until well blended. Cover, and refrigerate for 24 hours. Preheat the oven to 225 degrees F (110 degrees C). Divide the meat mixture into 4 equal pieces, and form each piece into an 8 inch long log. Place each log onto a piece of netting, and roll tightly. Twist the ends and tie with string, or fold under. Place sausage rolls on a broiling pan with a rack. Bake for 5 1/2 to 6 hours in the preheated oven. The internal temperature of the sausage should be 160 degrees F (70 degrees C). Remove and cool. Remove nylon net, and wrap sausage in foil. Refrigerate overnight before slicing. Store in the refrigerator for up to 2 weeks, or freeze for up to 2 months. Enjoy the bold, delicious flavors of smoked sausage and peppers. Use all ground beef, and leave out the paprika, sage and onion flakes for a milder sausage. This variation may be cooked for 3 /2 to 4 hours.